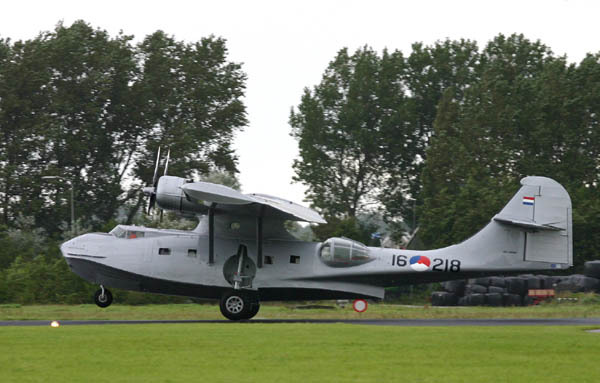 The Dutch Catalina PH-PBY restored ! On 20Jul04 I paid a visit to Naval Air Station Valkenburg, where the 'Stichting Neptune Association' (SNA - Stichting translates to Foundation) has its headquarters. NAS Valkenburg is to be closed by Nov.2005 and over the years defense cutback curtailed units and saw squadrons being disbanded. The SNA has found plenty of space in one of the hangars. Consolidated PBY-5A Catalina PH-PBY (c/n 300) shares this hangar with a few smaller aircraft (including 2 target-towing jets, nothing to do with the SNA). I was met by Mr Prudent Staal, one of three 'founding fathers' of the Neptune Association and he led me around the many storage rooms the Foundation uses in this hangar, to rotate spare parts, a library and for other projects. The name 'Neptune' in the name of the Association does not refer to the famous Lockheed patrol aircraft but refers to the association target, to preserve maritime aircraft which played a role in the Dutch 'Marine Luchtvaart Dienst' (Naval Aviation Service) over the years. When the restoration started about 4 years ago, in 2000, it was clear that it was going to be an immense task. 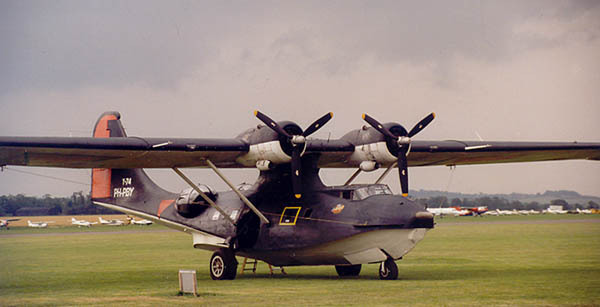 The previous owner, Catair, had ferried PH-PBY in 1995 from Canada to the Netherlands and with minimum repairs enjoyed the airshow circuit for a short while. But the aircraft needed more restoration and Catair fell apart. 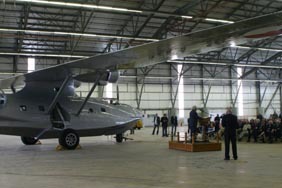 PH-PBY languished for a number of years until the SNA bought it and took to the restoration in earnest. The green patches show clearly where new skin has been applied. Also the 'blisters' used by Catair had to be returned to the owner, the Dutch Air Force Museum, and were taken off in rather a destructive way, according to mr Staal. These blisters are in short supply and installing them is a hell of a job. Fortunately the blisters came available again for the PH-PBY and it must be a great event to take a peek from this position when in flight ! Another photo to illustrate the many places that needed attention. A lot of work also went to the sealing of this 'Flying Boat', because that is what it is. Mr Staal showed me the many similarities with a boat, including a hefty anchor in the forward compartment ! The Catalina played an important role in the Dutch Naval Aviation before, during and after W.W. 2. Its 60th birthday was "celebrated" in December 2001 ! The initiative to restore this former US Navy (no Dutch Navy Catalina survived sufficiently to be restored to airworthiness) must be applauded. The present restoration is expected to cost a huge sum: euro 390.000 and the SNA welcomes any contribution to cover these costs. And on 06Jul04 it was issued a new Certificate of Airworthiness, a new lease on life, over 60 years after being manufactured... amazing ! Click in the image for a larger close up of the instrument panel. 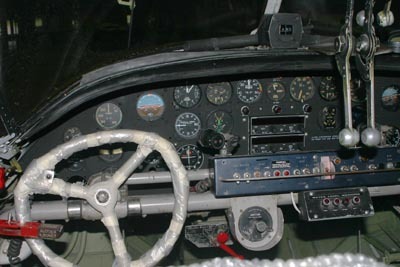 The cockpit is a cramped affair and can be accessed either from the top by opening a panel in the cockpit as well as from the cabin. While I was treated on this tour in and around the aircraft I was told that the restoration of the "Dutch Cat" would go beyond that other masterpiece, the Dutch Connie. PH-PBY will not only be officially entering the Dutch Civil Register but it will also get 16 white leather seats for 15 paying passengers ! The seats were still stored, no doubt after the aircraft is painted in its full colours they will be installed, but they certainly looked immaculate ! That one remaining seat is of course for the cabin attendant. In 1997 I came across PH-PBY at the Duxford Airshow (July 14th) and maybe the dark clouds in the background were an omen of some dark years ahead ? 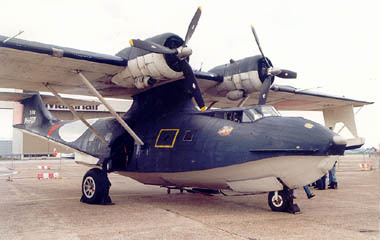 This PBY-5A Catalina was delivered from the factory to the US Navy with Bureau Number 2459, after its roll out 15Nov41. It was responsible for sinking a few U-boats during WW2. This airframe is reputed to be the oldest airworthy example in the world ! It ended it service life in 1945 but a year later was bought by Rio-Ten Airways and registered NC18446 (later N18446). It went through a series of owners in the US before being registered in Canada for Transair (of Winnipeg) as CF-HHR, also flying Central Northern which was linked to Transair. Exact details of its history between 1953 until 1972 seem rather vague. At some point in time it was converted to aerial firefighter by Field Aviation for Avalon Aviation. It was even deployed as far as Chile to perform this task ! Avalon ceased operations in early-1988 and CF-HHR was put in open storage at Parry Sound, Ontario where it languished 9 (!) years before the Dutch group Catair bought it in 1994 and restored it while painting it pre-1942 Dutch Naval Air Service markings, the orange triangle and Y-74 numbers. 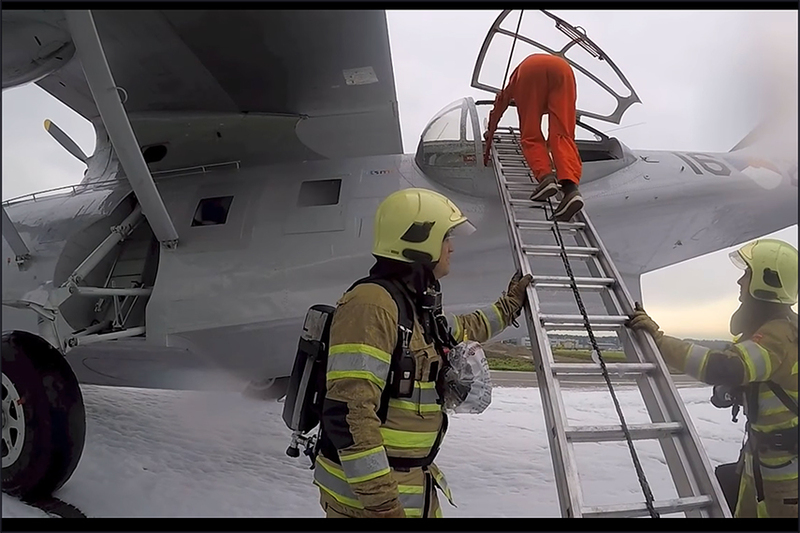 The fire-fighting equipment was taken out of the aircraft, though some modifications remain visible. The 'Dutch Cat' arrived in Holland as C-FHHR in Apr95. It had been registered on 19Apr96 as N27311 to Western Aviation Maintenance (of Mesa,AZ); Marien van Schie (owner of PH-PBY 1994-1998) told me this was to cover the period when it was struck from the Canadian Register and had not been entered into the Dutch Register yet. 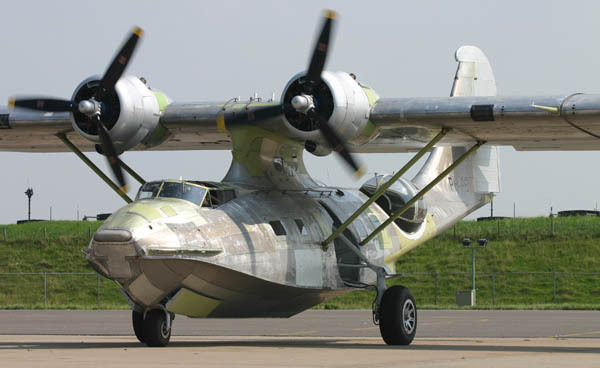 On 06Feb97 it was entered in the Dutch Civil Aviation Register, as PH-PBY. There is a story to the blisters. Another Dutch Catalina, 16-212 (owned by the Dutch Airforce Museum) provided the blisters that had been removed from C-FHHR. When Catair folded, the blisters were reclaimed by the Airforce Museum, but found their way back to the SNA and PH-PBY. This is the only surviving PBY-5A Catalina of the Dutch Navy.... the 16-212 (cn 1679). After it ended its service life it was lend to .... a swimming club in Hoeve. Kids climbed over it and people took souvenirs, not a dignified fate for such a vintage flying boat. But awareness of our industrial heritage had not reached its present peak and money was in short supply. In 1982 it was transferred to a Logistics Depot at Gilze-Rijen Air Base and the next year it was transported in parts to Naval Air Station Valkenburg. Externally it was restored, fabric covered ailerons were covered with aluminum plates. This took 10 months and was intended to have it ready for open air display. Upon which it was transferred to Military Air Museum (MLM) in Zeist. In 1995 contact was made with the SNA and 16-212 moved back to Valkenburg in Apr96. 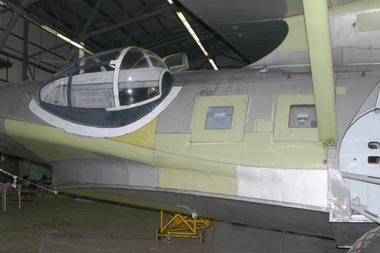 During 2000 the fuselage was restored and windows had been placed in the cockpit. There is still a long way to go... The SNA will take care of further restoration and will also pursue replacement of blisters on this airframe. 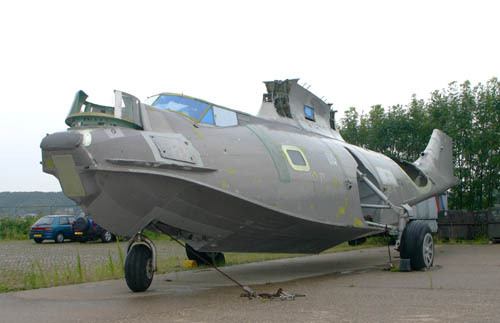 By early Aug04 16-212 was seen on groundtransport to QAPS at Amsterdam IAP to be painted; meanwhile it seems to have returned to the Militair (Military) Air Museum at Kamp Zeist (Soesterberg). During 2005, upon closure of NAS Valkenburg, the SNA will have to move and their destination will be the Aviodrome, the Aviation Themepark at Lelystad. During 2009 restoration of 16-212 continued. The blisters were reattached and one was allowed to hope to see the restoration completed sometime during 2010. Excellent weather on this day and all was in place to witness the event that took some 4 years of hard work by the members of the SNA and its volunteers. Among the crowd also old timers who had actually flown on the Cat during its service in the East. Unfortunately for me, a mad dash from work did not get me there in time... I was getting clearance at the gate when I saw the PBY-5A climb over the hangars ! But I rejoiced when I heard the 1200-hp Pratt & Whitney R-1830-92 Twin Wasps reverberate through the dunes of the Dutch coastline. Unfortunately one of the engines developed a small hydraulic leak, not enough to shut it down, but better to return and with a wide arc it landed again after having been airborne for less than 10 minutes. 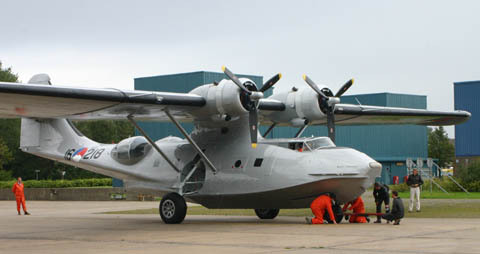 Still, it had flown after 4 years and people applauded and cheered when PH-PBY came to a stop at the ramp. Prudent 'Pru' Staal, last of the 3 aviation enthusiasts responsible for starting the Stichting Neptune Association, is seen walking towards the towtruck. He is a retired engineer of the Dutch Navy (Aviation branche) and one of the driving forces within the SNA. Chairman of the SNA is Arjan Dros. Another look at this unique Flying Boat, to savor the triumph the people must have felt upon completion of 4 years of restoration. Of course it isn't over yet... After the hydraulic problem on the engine was dealt with, the 'Dutch Cat' flew again on Saturday 07Aug04. 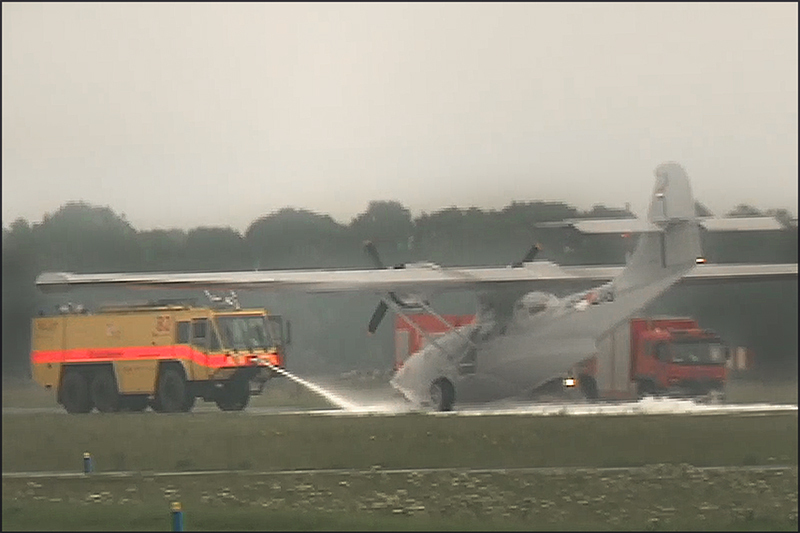 PH-PBY was reported being seen flying to Amsterdam IAP for a paintjob by QAPS on 11Aug04. The Catalina participated in the airshow at Lelystad on 04Sep04. Time for speeches and champagne ! In a well organized event, the PH-PBY was presented to sponsors, members, volunteers, press en well-wishers. The Catalina's name Karel Doorman was revealed by the widow of this famous Dutch (Rear) Admiral, who was killed on 28Feb1942 in the Battle of the Java Sea. 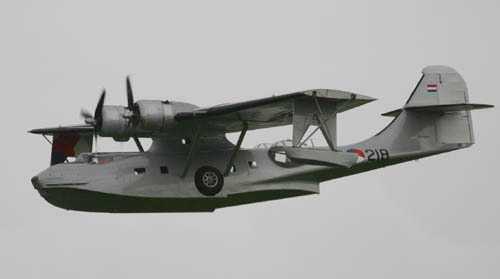 The Catalina is a unique amphibious airplane of which the Dutch Navy operated 78 during the period 1941 until 1957, mainly in the Far East. 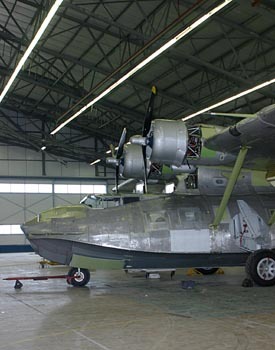 For almost 5 years, volunteers as well as professionals worked hard on the restoration of PH-PBY. The first year, 1999, hardly any work was done as initially it was thought a 400 hours check would be sufficient to bring it back in the air; but at that time specialists to do that kind of work were almost impossible to come by, plus findings revealed the airframe needed a lot more work than just a 400 hours inspection. The registration 16-218 is not an original registration of this aircraft, as this particular aircraft never flew with the Dutch Navy. C/n 846 was manufactured in 1942 and delivered to 321 Sqdn at Ceylon on 01Nov42, coded R. It went through a series of registrations with the Dutch: Y-83, Y-83/R, P-83, 16-83 and 16-218. It served until 1957 when it was scrapped. As indicated in the speech by the Chairman Arjan Dros, the name Karel Doorman is also a token of respect to all those who worked with the Marine Luchtvaart Dienst - MLD. 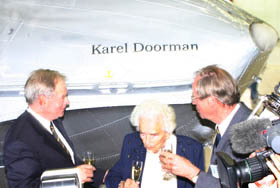 Lou B. Dorny from Seattle,WA offered: "I find it exceptional as well, to have the plane named "Karel Doorman. Rear Admiral Doorman was himself a naval aviator, and former commander of the MLD in Nederlands Oost-Indië (Dutch Indies)." Thanks Lou ! With the sale of the P-3 Orions and no survivors of the Breguet Atlantic, the Consolidated Catalina will soon be the only surviving fixed-wing aircraft of the Dutch Navy. In his speech, Arjan Dros (former Breguet Atlantic pilot) indicated the Ministry of Defense was welcome to call on the SNA should they find need for a patrol aircraft (one could think of a Search and Rescue mission), as this PBY-5A is now better than new ! "The Dutch Cat" performed a few low passes for the benefit of the crowd that had gathered. Unfortunately, Pluvius sent his blessings and the rain was really pouring down on us... No doubt the crew felt the brisk wind, but they performed well considering these circumstances. Another fly by, this time with the floats lowered and the gear tucked away. Note the Dutch military roundel on the inside of the righthand float. The small black lettering below the stabilizer says "Kon. 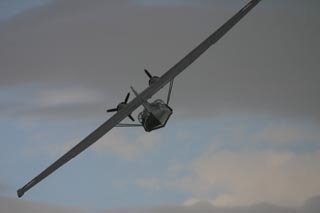 Marine" and hardly readable, slightly above (but still below the horizontal stabilizer) is the actual tailnumber, in small black lettering, "PH-PBY". A nice profile against the dark clouds, an exceptional aircraft it certainly is. Greetings to my "Old Friend", PBY5A 2459. It is certainly wonderful to see you Airborne once again, and appearing so beautiful and healthy. You probably do not remember me, but I spent over 100 hours in your pilot seat, during your younger days, between 12 January and 8 August 1943 as you carried my crew around the North Atlantic Ocean from Reykjavik. At that time of your life we were either escorting convoys, protecting them from U-Boats, or checking on the Ice Flows as they moved south from the Arctic Ocean into the North Atlantic where they could cause problems in the shipping lanes between New York and Europe during WWII. It is really a pleasure to see you Flying again. 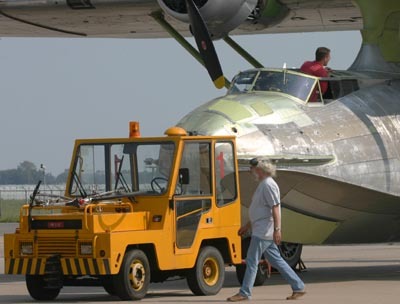 This Catalina is definitely a great addition to the Industrial Heritage of Holland, a restoration to be proud of. 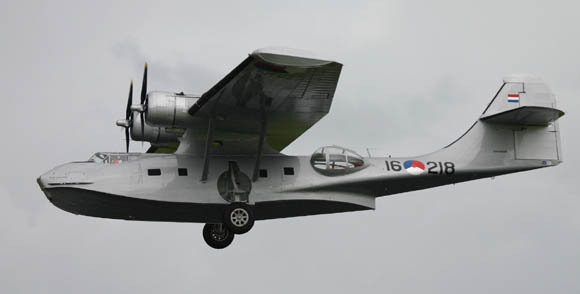 PH-PBY will join the European Air Show circuit in 2005, with 15 seats for sale (1 for a cabin attendant). The opportunity of enjoying a trip on board this 'vessel' is not to be missed ! Its 1st Public Appearance, Lelystad Airshow 2004 ! 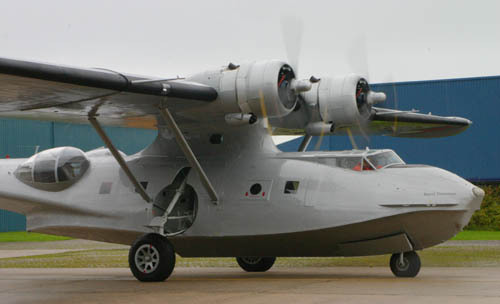 When PH-PBY was hangared for the winter of 2004/5, Chuck Ellsworth had done one hundred and twelve water landings during the test flights and training. He went home (to Canada) well pleased with PH-PBY and its enthusiastic crew! I would like to thank NAS Valkenburg for allowing me on their premises and Mr P. Staal for his time and dedication. "Consolidated PBY Catalina - The Peacetime Record" by David Legg (Airlife, 2002); recommended reading for the Catalina enthusiast ! "The Catalina Logbook", special edition. 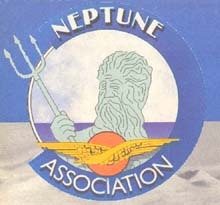 www.neptune-association.nl, help and contributions welcomed ! MY FLIGHT WITH THE CATALINA 15AUG09!!! Heading out for a ' Splash-'n-Go' at the Markermeer. UPDATE (may 2017)): The Dutch Catalina Club had a bad start for the 2017 season! The first flight, about an hour long on 20Apr17, proceeded uneventful. Then on the 2nd flight that day abnormal vibrations were observed on the starboard engine and an immediate landing was made. A check found a cracked cylinder and an oil filter was saturated with metal parts: they were in for a complete engine change! Fortunately a benefactor stepped in, providing a loan, and by 31May17 Ph-PBY was seen flying again! 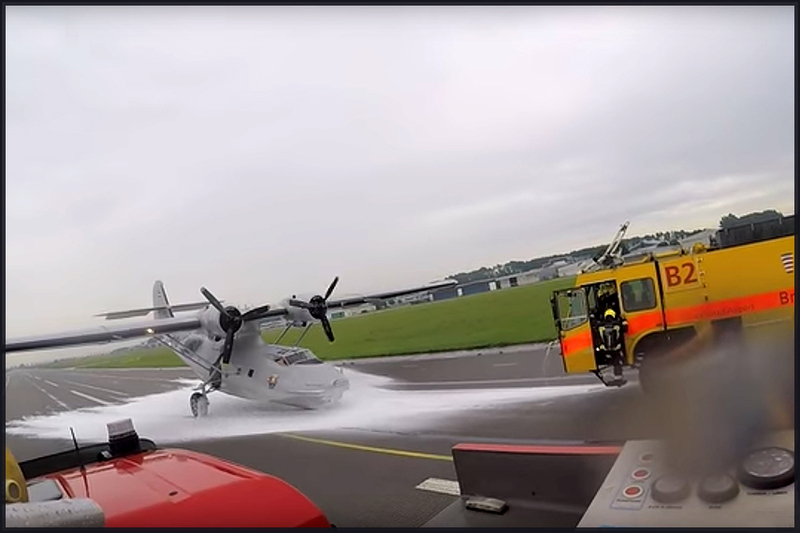 Alas, 2017 seems to be a year with little luck for PH-PBY: on 15Aug17 it made an emergency landing at Lelystad Airport (LEY/EHLE) because the noselandinggear refused to deploy. Minor damage and no serious injuries. The incident last year brought costly repairs and took a long time to complete, grounding the Catalina for almost a year. While the airworthiness was fully restored, it showed that the margins were small and a sound utilization cannot be met in the present conditions. A factor in the evaluation was the shortage of qualified engineers plus the fact that the Dutch Government never was enthusiastic about vintage aircraft flying and have put in place new rulings, considering operations with paying passengers a commercial operation with all that it may entail (reducing tax benefits). During the summer of 2018 one of the engines sustained serious damage and the rest of the season was cancelled, thus loosing valuable revenue (also required for repair of this new setback). Hence the decision to cease the activities and sell the PBY-5A; it was never likely that they would find a buyer in the Netherlands, probably not even in Europe. 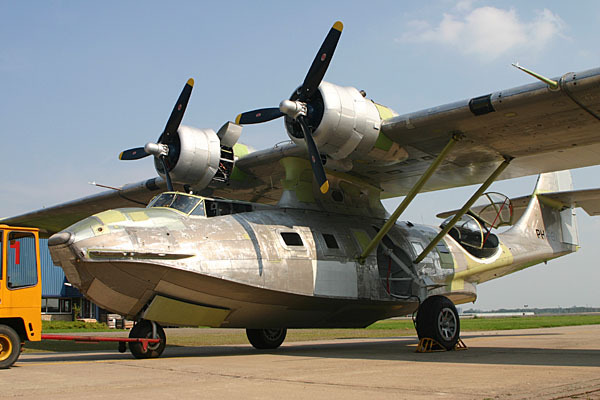 Read an update in Verenigde Vleugels 2018 #4, that PH-PBY had been sold (11Oct2018) to the Collings Foundation. 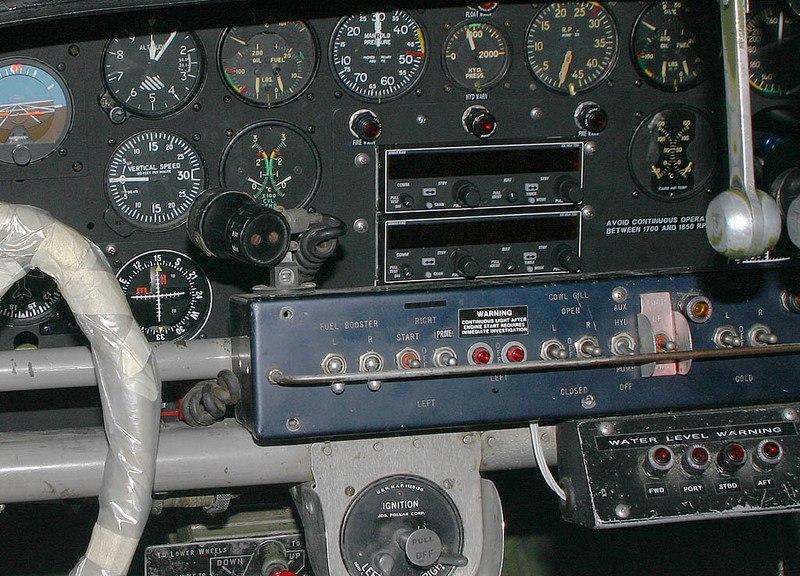 Robert Collings had on an earlier date voiced his interest in this PBY-5A Catalina. It was also posted on the Scramble forum (in Dutch, written by Prudent Staal).